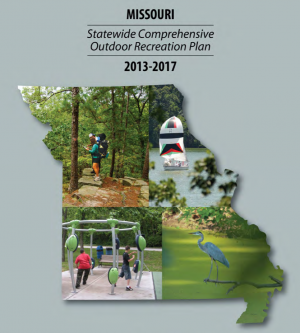 All this is according to the most recent version of the Missouri Statewide Comprehensive Outdoor Recreation Plan (SCORP), which undertook one of the most thorough surveys of Missourians' outdoor recreation activities and preferences ever. All this means that Missourians spend many hours walking, running, bicycling, and using trails. We spend a great deal of time and money on these activities--because we value them highly. 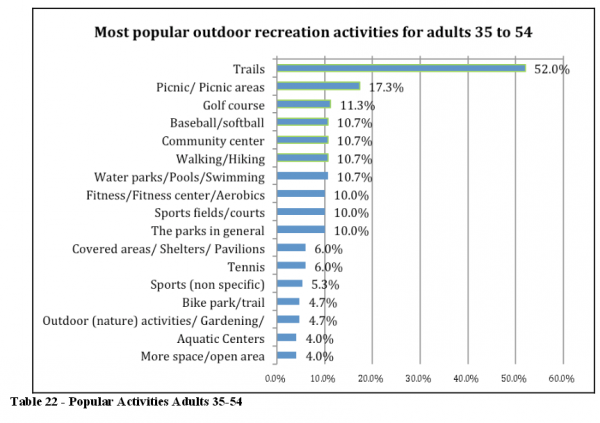 Missourians put a priority on having good, safe places to walk, run, hike, and bicycle and are willing to spend our tax dollars and resources to create and maintain safe places to walk and bicycle. In this report, the numbers speak for themselves--so let's have a look at them. Click on any graph to see a larger sized version. In light of recent proposals to allow ATV use on the Katy Trail, it is interesting to note where the popularity of ATV riding falls in Missouri in the spectrum of outdoor recreation activities on the chart. About 21% of Missourians use ATVs at least annually (1.3 million) and about 15% (0.9 million) use ATVs monthly. 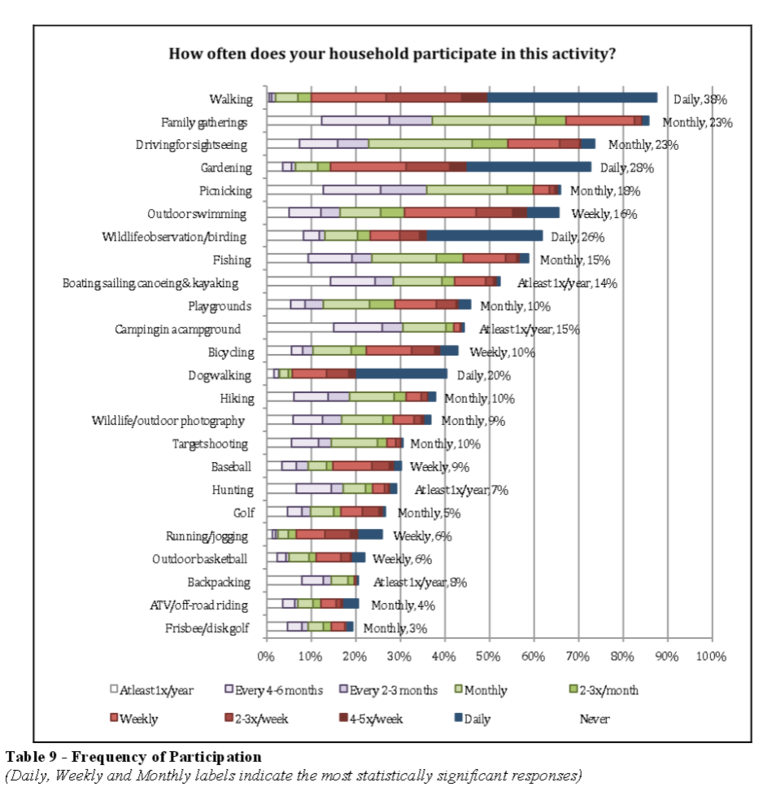 Other surveys of ATV use indicate that about 75% of ATV use is for hunting, fishing, road riding, and use on private lands. About 25% of ATV use is on designated ATV trails or parks. This is a significant user base and Missourian trail organizations and agencies need to work together with ATV users to ensure that sufficient ATV trails and parks are available for appropriate use. 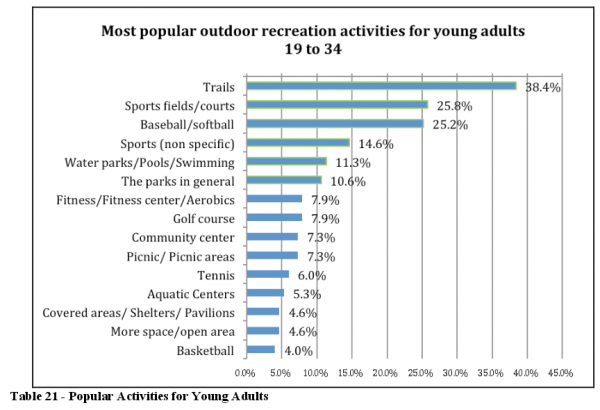 Lack of sufficient trails and walkable streets/sidewalks in Missouri for walking/running/hiking/bicycling and of trails and park areas for ATV use was noted in the report (p. 64). 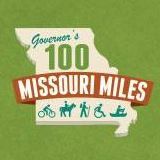 Where do Missourians bicycle, walk, and run? Walkable streets/sidewalks, local parks, gardens, fishing sites and outdoor swimming pools are the most popular facilities used by Missourians at least monthly. . . .
Three out of four Missourians use local parks and walkable streets/sidewalks at least once a year. 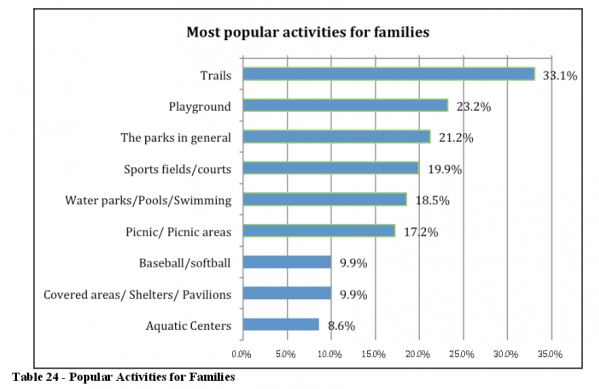 Note that walkable streets & sidewalks are among the most popular and most used facilities. That is because streets and sidewalks reach into every neighborhood and are close to and available to everyone. That is why we spend a good deal of time working for Complete Streets, Bicycle Friendly Communities, and Walk Friendly Communities--these are facilities that can be in every community, every neighborhood, and reach every Missouri. 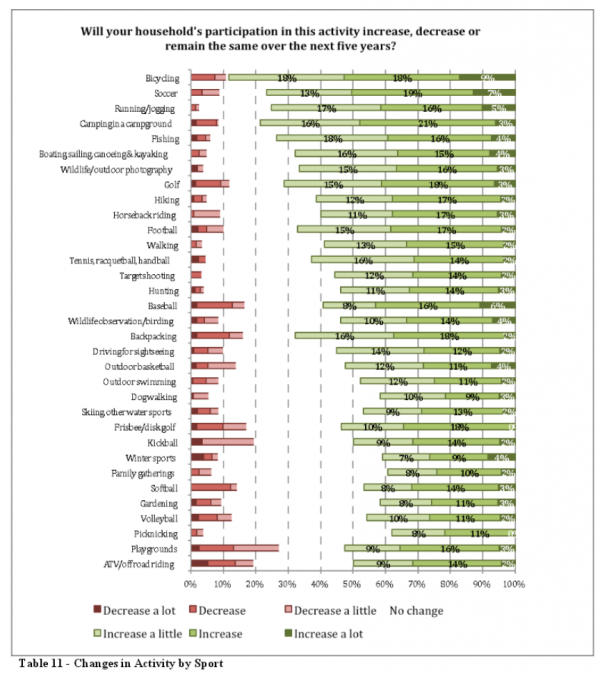 Bicycling is the number one outdoor recreation activity that people want to and anticipate being able to participate more in the future. This is a testament to the work of numerous parks, trails, public works, and advocacy groups across the state who have worked hard to create and expand Missouri's trail and bicycle route systems. But it also speaks of a desire among Missourians to be able to bicycle, walk, hike, and run more--we want more safe places available to participate in these popular and healthy activities. 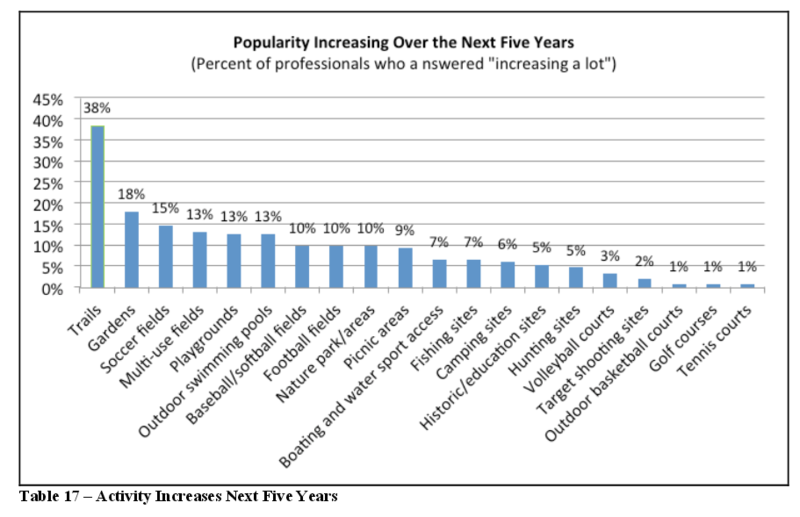 The SCORP surveyed a wide spectrum of Missouri outdoor recreation professionals to get their viewpoint on facilities, needs, and trends across Missouri. In short, the popularity of trails has increased dramatically over the past few years and will continue to increase over the next few years. 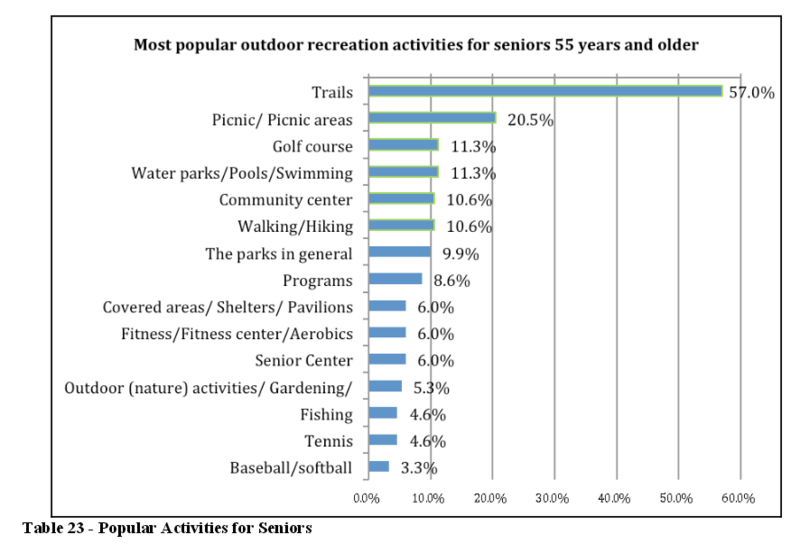 In short, when we say that walking, hiking, running, bicycling, and trails are important to Missouri, that Missourians spend millions of hours and billions of dollars on these activities annually, and that Missourians want to improve facilities for walking, hiking, running, and bicycling we mean it--and we have the data to back it up. 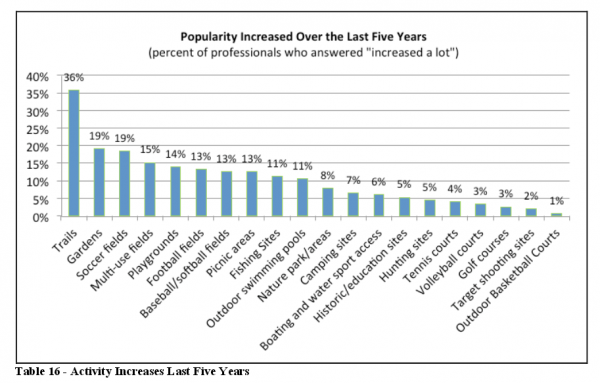 Bicycle and trail sports are each--individually--billion dollar industries in Missouri. These activities are often overlooked and undervalued in Missouri. If we want to remain competitive in a global marketplace--where communities across the U.S. and the world and increasingly paying attention to these needs--we need to pick up the pace. Missouri still has no dedicated state funding for bicycle and pedestrian transportation. We are talking about fuel tax funding for highways, but nothing is on the table for walking, bicycling, trails, or transit. We continually see bills and proposals in the state legislature to ban bicycling, cut funding for bicycling and walking, and reduce the appeal and usefulness of trails. In a world where walking, bicycling, and trails are dramatically increasing in popularity across Missouri, the nation, and the world, these proposals cast Missouri in a very negative and backwards light. Many more needed improvements to policy, planning, and funding at the local, regional, state, and national levels are outlined on our Campaigns page. Many powerful, organized, and effective walking, running, bicycling, and trails organizations, clubs, and advocacy groups are thriving in Missouri--working hard to make the needed improvements in their communities. These groups are in large part responsible for instigating the improvements and changes that have made walking, running, hiking, and bicycling as popular as they are in Missouri, and have helped create the facilities that make these activities possible and safe. Walking, bicycling, and trails are important to Missouri. We knew it before, but now the data from the SCORP gives us even more support and clarity when we make that statement. Working to create a world-class, complete, connected transportation system for Missourians who choose to walk, run, hike, and bicycle, to build a movement in support of walking, bicycling, and trails, to improve safety for everyone who uses the road or the trail, and to encourage more Missourians to walk, run, hike, and bicycle more often are the four key goals of MoBikeFed's Vision for Bicycling and Walking in Missouri. « Previous story: MoBikeFed Events - Join us for rides, runs, races, and more in 2016!